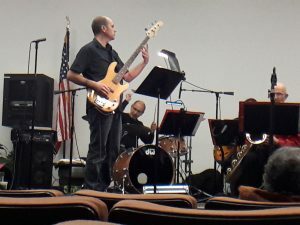 Little Mountain Big Band rippled the air with funk and Chicago tunes during their free concert this past Saturday at the Big Wong Auditorium Feldheym Central Library in San Bernardino. Dr. Robert Winokur, band director, explained in detail about the types of genre the band covers and how their style sets them apart from other musical groups. Their covers range from jazz composer and bassist Charles Mingus to singer and multi-instrumentalist Stevie Wonder and play some original music. “We’ve concentrated on music that’s not typical of a big band […] No one has that particular arrangement we do,” explained Winokur. Winokur added that he was part of a music group in Redlands for a year. “I looked around and said ‘How come we don’t have a big band? There’s enough of us here that play those type of instruments that we should have a jazz big band.’ then everybody was like, ‘Yeah, that’s a great idea-you should make it happen.’ So here I am,” said WInokur. “This is our fourth year […]. We started off as an offshoot of that group, but now, we’ve become our own thing,” he continued. Fun fact: WInokur has a running joke that goes,”Little Mountain Big Band—we’re on fire!” which his fellow band members playfully hates. The band kicks off the show with “Mercy Mercy Mercy” by Joe Zawinul. Linda Yeh, the program coordinator answers why Little Mountain Big Band were contacted to perform. “Well, I know the head of this band, Robert Winokur, and he suggested performing here and I thought it was a great idea. I’m always on the lookout for different programs,” said Linda Yeh. “Well, so many [concerts] are so expensive[…] our mission at the library is to have entertainment and education for people […]. 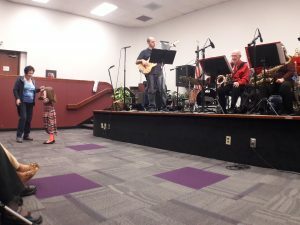 To bring the community together, to get people to come to the library who might not normally would not come to see that we have all kinds of things happening and the people who are regulars to the library- to give them something extra,” continued Yeh. “What makes it worthwhile is that there are musical moments on stage and [in the] rehearsal room where everything sounds right and feels good […] this really warm feeling […],” said saxophonist Dr. Marcus Willshure. “Like euphoria-all of your problems are melted away. You’re with the band- in the moment. Just happy[…] happy and free,” continued Willshure. Willshure further explained that coordinating meet times and rehearsals are challenging, but ultimately, the finished project is worth it. They will be performing on campus April 26, 2017 at 6:00 pm on exact location still in the works. Learn more about Little Mountain Big Band on their Facebook page: www.facebook.com/littlemountainbigband.